A gorgeous beast of a crow with a give away white patch so we know it's him. He lives in the tree in the field out the back and frequents our garden, leaving the bird feeders for the little'uns, he usually brings his own hunk of hard bread and soaks it for a few moments in the bird bath before swooping off to devour or share. 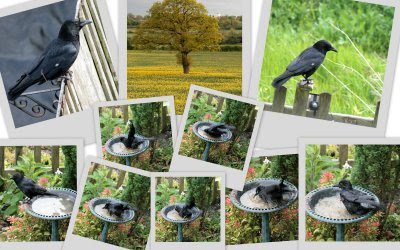 Consequently the bird bath is a little, um, bread coloured, however this doesn't stop our lovely crow, for when he thinks nobody is looking he'll sidle over and up into the bird bath and have a right frolic about! One day I WILL get an in focus photograph of him! Great pictures. Have to admit though I am not a fan of crows can't help thinking of the Alfred Hitchcock film when I see them. Ha! You're not alone in that I'm sure! there's a blackbird lives near us with a white patch, strange isn't it? Aw what a funny little chap! I don't normally like crows but he's quite a character! We have a bird feeder on our tiny balcony and love watching the birds come and go. I love having regular garden birds in our garden too - we've got an albino blackbird. As Kate said, he does look like a character!